It’s March 14th, aka 3.14, aka short for mathematical ratio of a circle, aka pi (3.14159265359 and it goes on). What makes it most important this year is it is Rounded Pi Day, 03.14.16. Get it? This year we can round it up to four digits! So in honor of Pi Day and all things with a circumference, I baked pie. Because what’s round and sounds like pi? 😉 Ok, well, I made pie. I came across a delicious no-bake recipe of No-Bake Peanut Butter Pie from AllRecipes.com and decided to try it! It’s melt-in-your-mouth delicious!!! Especially for those whole love peanut butter AND chocolate. 1. Beat cream cheese and powdered sugar together. 2. Mix in peanut butter and milk. Beat until smooth. 4. Spoon into two 9 inch graham cracker pie shells; cover, and freeze until firm. Should be frozen between 2 1/2 – 3 hours. 5. After pies are frozen, squeeze chocolate syrup in zig zag motion. 6. Grate some parts of the chocolate bar and sprinkle on pies. 7. Cut remaining chocolate pieces and add as topping. The great thing about this recipe is you can also make it “low fat” by substituting ingredients with their light versions- light cream cheese, skim milk, light whipped topping and reduced fat peanut butter. Unlike the infinite and complex pi number, this pie is so simple to make, so easy as pie! 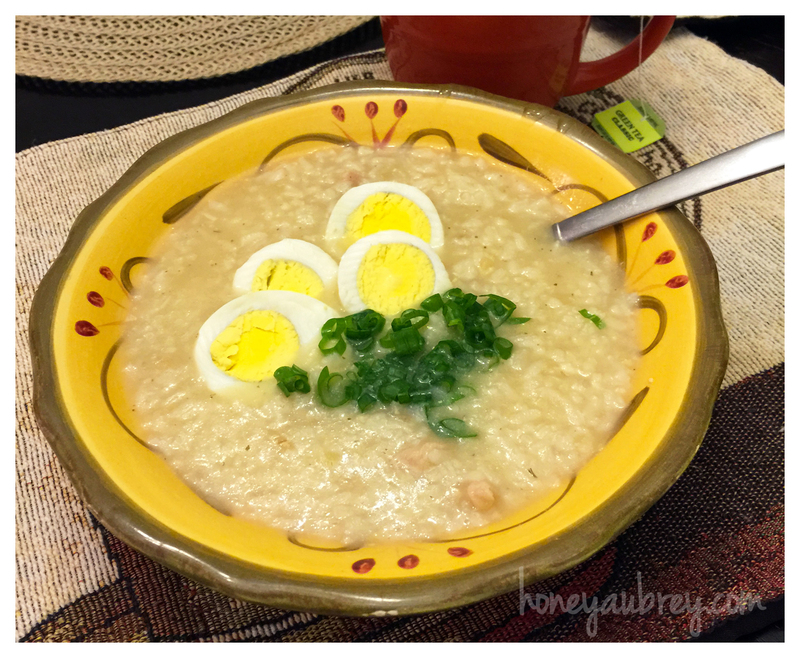 Growing up in a Filipino family, my mother always made arroz caldo to soothe our sickness. What exactly is arroz caldo? It is a type of congee (rice porridge) that originated from the Chinese, but officially named by the Spaniards as “Arroz Caldo” since the Filipino natives had a hard time pronouncing Chinese terminology. Anyway, mama’s arroz caldo was easy to digest, keeping our tummy warm from the cold was the best medicine. Psychologically that must also be another reason why I hated and denied being sick because it made me miss her even more. Arroz Caldo was the closest thing to her being by my side again. I never learned her recipe, so as an adult, whenever I would get sick I’d seek the best arroz caldo in the island. So far, Thelma’s Restaurant in Waipahu is the most comforting. In a big pot, sauté garlic, onion, and ginger in oil. Add chicken and cook until lightly browned, add fish sauce and continue to cook for a few more minutes. Add rice, until lightly browned, then add water and bouillon cubes, and bring to a boil. Make sure to remove scum from rice that floats to the surface of the pot. Lower heat, continue to simmer, stirring occasionally, until chicken is tender and rice is thickened and cooked. Serve immediately, as it tastes better hot. Garnish on top with sliced boiled egg, green onions and a hint of lemon or lemon juice. Surprisingly, it turned out not-so-bad. Although I hope this comforts you in your not-so-good days as it did for me tonight. Today, October 14, is National Dessert Day, which means if you haven’t done so, CELEBRATE the day by treating yourself to all things SWEET!!!!! Cookies, cake, cupcakes, candies, ice cream- anything to your heart’s desire darlings! 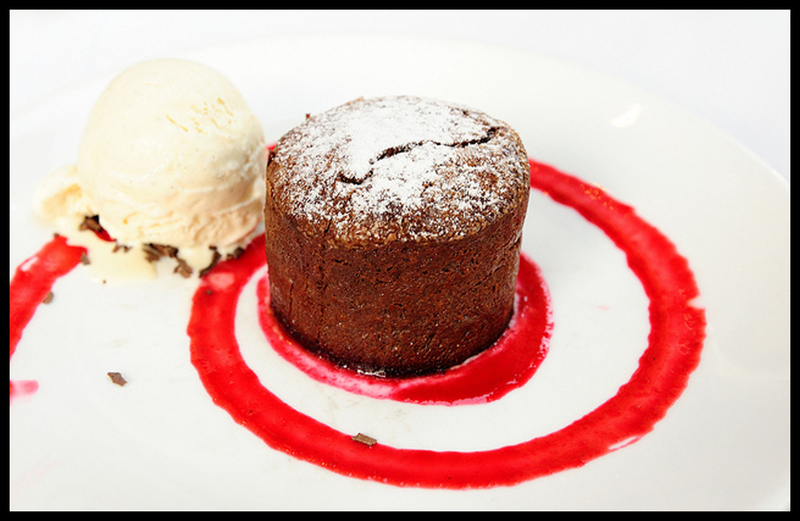 A flourless chocolate cake with a hot, molten center, served with raspberry coulis and vanilla ice cream. ENJOY!!!! Have a sweet night! Tonight, I had the wonderful opportunity to attend one of the most amazing events I have ever experienced, thanks to my sister, Natalie…. More photos later, but here is an idea of my outfit for the evening. 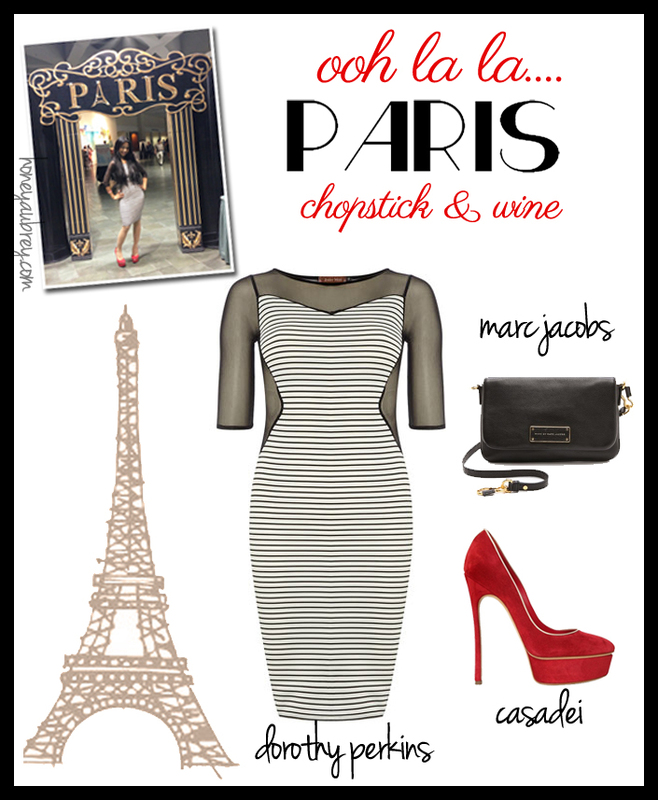 Stripes & red- very Parisienne!